Do you have an expensive watch? Are you an obsessive compulsive? 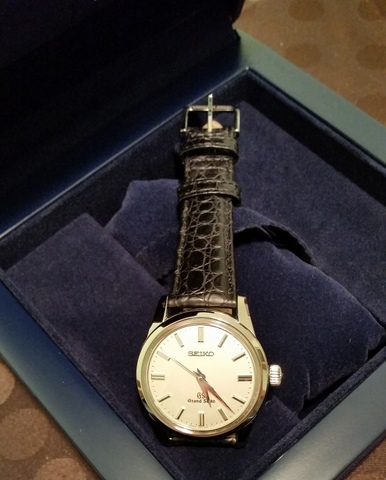 If you're an OCD luxury watch owner, then you probably tuck your watch to sleep every night in a padded box. You wear long-sleeved shirts even in August to protect your watch. You never wear your "good watches" while performing perilous activities, such as bumper cars and bowling. 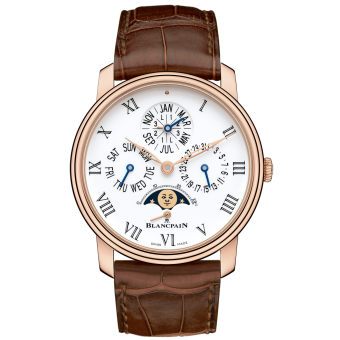 Blancpain Villeret. Photo from Blancpain. Holding your cell phone in the same hand as your watch will magnetize your watch. The bracelet on your new watch will either be one notch too big or too small. In the summer, humidity will leak into your watch through the crown when you adjust the time, corroding and destroying the movement. Constant exposure to light and then dark will make the lumes run down. When you remove your belt, you can easily lose control of the buckle and scratch your watch. When you enter a country, customs will levy a duty on your watch, even though you've owned it for a decade. You might lose both arms in a freak farming accident, rendering your watch collection useless. People will notice your watch and snicker to themselves because they think it's a fake. Your watch might be a fake. That sound you hear when you move your wrist? It's not the automatic movement's rotor. It's an insect that somehow got inside your watch. Your diver watch will attract sharks. If you wear your watch outdoors at the wrong angle, your watch's crystal will magnify the midday sun and melt the watch hands. Sodas are acidic and if you open a soda near your watch, the carbonation will propel invisible acid droplets into the air, which will land on your watch and corrode it. Wind your watch too much and you'll break the spring; don't wind your watch enough and the spring will weaken over time. Not keeping your watch in one position at least 50 percent of the time, with the face at a 90-degree angle to the force of gravity, for example, will degrade the movement's accuracy. That means that you need to work with your watch-arm hanging off to one side, and that you need to keep your watch in that position when you take it off to shower or sleep. The cabin pressure of a commercial aircraft is set to 8,000 feet above sea level, and the pressure differential between the cabin and the space under your watch's crystal can weaken the crystal's seal. The person who's interviewing you for a new job is wearing the same watch as you—except that his is steel and yours is gold. Birds have to go to the bathroom somewhere. Bad guys will see your expensive watch, follow you home...and you know how that ends: You're alive, but without any of your watches, is life worth living? also,that's why i wear a rolex!